The Institute of Public Policy (IPP) organizes a professional training course entitled “Academic Behaviour and Academic Freedom” for lecturers of RA Higher Education Institutions. Qualified specialists in the field of education and researchers will deliver lectures. The lectures will be accompanied by practical and independent work. 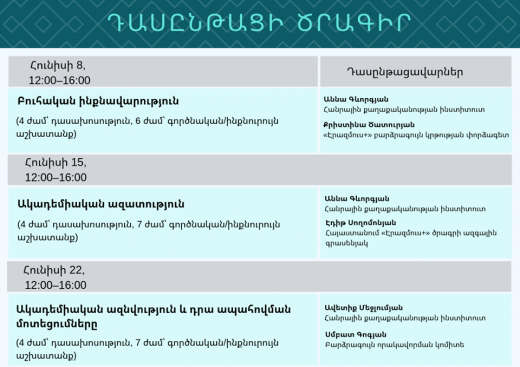 The training will last from June 8 – June 22, every Saturday (12: 00-16: 00) in Yerevan. Participants will graduate with certificates based on which Higher Education Institutions may allocate vocational training credits. If you have any questions, feel free to call +374 60 54 18 47. The training program is available here.